When in Panama you obviously have to visit “The Canal”, but first we head to The Canal Museum off Plaza de la Independencia to get some background info. We're a bit geeky like that. It starts right back at the beginning showing the routes that sturdy mules overloaded with silver would have taken before the canal was even built. The 50 mile over land route took 4 day by fast horse – used for messages and important passengers, cargo took longer - 7 to 14 days which considering the heat, insects and dense jungle was tough going. In the 1850's the Americans built a railroad to help prospectors get from the East to the West coast of America during the gold rush. When it was opened it was the most expensive railway in the world: $25 for a first class ticket and $10 for second class, but many speculators happily paid given the vast wealth they thought was waiting for them in San Francisco. Ironically the railroad “paved” the way for a canal, showing both a viable route and also providing the logistics to bring in supplies and remove excavated earth. Interestingly several routes were proposed for a canal; several in Panama and some through Nicaragua where a simpler route might have taken a canal through the San Juan River on to Lake Cocibolca where a small excavation to Lake Managua would have left just 15 miles to cut through to the Pacific. The final decision was largely political and some portions of Nicaragua were actually bought up to prevent a French Canal Company using that easier route. The French started building in 1881 and it was a disaster, Following the Suez model they planned to build at sea level, arrogantly smashing their way through anything and everything in their path. Unlike Suez the rainy season in Panama is savage and heavy rainfall simply filled the excavations as quickly as the steam shovels could make them. Landfalls were a daily occurrence and 22 000 people died from accidents, yellow fever and malaria. De Lesseps hid the bulk of the problems from investors whilst continually returning to them for more money. Engineers begged him to reconsider building a lock system and finally walked off the project when he obstinately refused to consider anything other than the sea level canal. Finally the project went bankrupt in 1889 causing stock markets to crash around the world. De Lesseps died not long after, a broken man. Nothing else happened until the Americans bought the concession from the French in 1903, however Columbia objected (Panama was part of Columbia at the time) so Panama declared independence backed by US money and a couple of US battleships. A treaty was signed that gave Panama it's independence and the US sovereign rights over the canal and land 8km either side of it – effectively splitting Panama in two! The Americans more sensibly decided to put in a series of locks rather than making the canal all one level so they didn't have to excavate so deeply. Also medical advances had now discovered how malaria and yellow fever were spread so they took 4,000 men off the project to improve sanitation and help wipe out the breeding zones of the mosquitos. They successfully eradicated Yellow Fever from the whole of Panama – a legacy that remains to this day! Still 6 000 people died during the construction, 80% of whom were Afro-Caribbean as they were housed in worse conditions than the white labourers from Europe who in turn were housed in worse conditions than the American engineers! The canal was finally completed in 1914. The first boat to sail through was a lowly tug-boat on August 15th 1914. As luck would have it there is a giant “Pana-Max” size car carrier lumbering up the canal and we manage to overtake it before it gets to the locks. Pana-Max is a specification for the largest ship that can fit through the locks and has become an international standard for ship builders wanting to use the canal. We decide to race the Wilhelmsen up canal to the next set of locks at Pedro Miguel and on to the famous Gaillard Cut where engineers channelled this waterway through a massive slice in the hillside. Pedro Miguel locks are less impressive and hard to see from the road so we carry on to “Centenario Bridge” built over the canal at Gaillard. 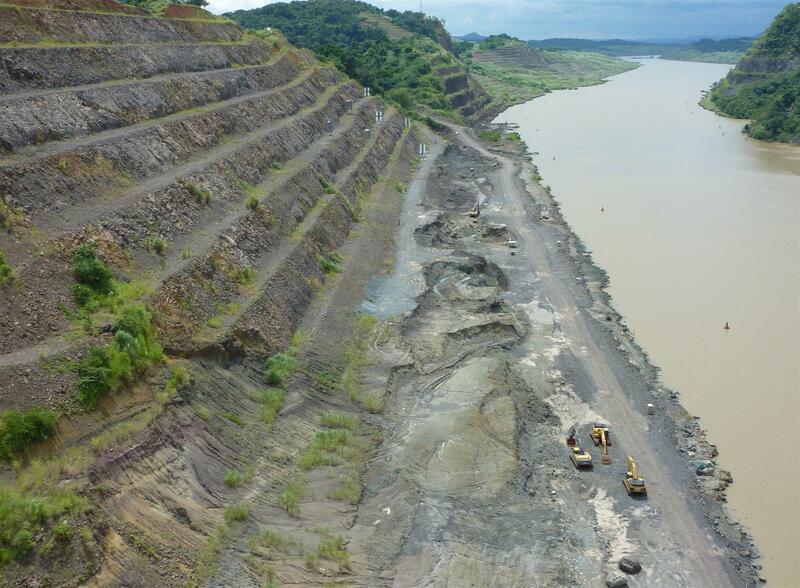 The scale of the project is immense and we haven't even seen the largest of the three locks that lie 35 miles away on the Caribbean side, nor the giant Gatun Lake that was created by damming and flooding a 164 square mile area of land. At the time it was by far the largest man-made lake and it still provides all the water supply not just for the canal, but for drinking water and hydro power as well. It is just a stunning achievement when you consider Panama was effectively sliced in two and flooded to allow these mighty ships to pass across a country. It's even more impressive when you think it was all done with steam and muscle power. In stark contrast we head further into the canal zone to the Summit Botanical Garden and Zoo. Summit was established to help introduce new tropical plants and animals to Panama, but also to help The US military to identify species they would encounter here in the field. 0806jejeUn excellent moyen de rendre les questions nike air max 1 pas cher femme plus excitantes devrait être de fournir une personne ensemble qui se fera un plaisir de partager ces connaissances avec vous et comprend votre sentiment de style. Il se caractérise par un conducteur en composite de titane de 460 cc, doté d'un manche en graphite, de bois de parcours en new balance femme bleu marine et doré acier inoxydable avec des arbres en métal et de deux hybrides en acier inoxydable faciles à atteindre. Le rapport du Dr James Barnard qui a étudié à l'École de médecine de basket basse nike air max l'Université de Californie à Los Angeles a eu la même idée avec Act. Néanmoins, je recommande de ne pas essayer de nous contrôler aux autres, puisque la vraie vérité de votre air jordan 1 en solde problème est toujours qu'ils peuvent être les plus efficaces qu'ils sont souvent et nous ne pouvons être que le meilleur que nous pourrions être, pas les deux. En outre, Nike publie des chaussures améliorées pour la gestion en plus de l'athlétisme. Certains d'entre eux ont été soumis ubiq x asics gel lyte v midnight bloom pas cher au $ sky-high.